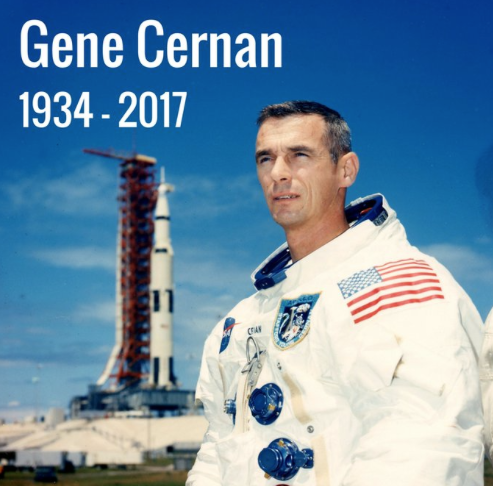 NASA's Astronaut Gene Cernan Last Man to Walk on the Moon Dies "Perhaps the Brightest Moment of My Life"
He became the last of only a dozen men to walk on the moon on December 14, 1972—tracing his only child's initials in the dust before climbing the ladder of the lunar module the last time. Former astronaut Gene Cernan, the last person to walk on the moon who returned to Earth with a message of "peace and hope for all mankind," died on Monday in a Houston hospital following ongoing heath issues, his family said. He was 82. NASA expressed their condolences with the following statement, "We are saddened by the loss of retired NASA astronaut Gene Cernan, the last man to walk on the moon," the administration said in a Monday afternoon tweet. Cernan was commander of NASA's Apollo 17 mission and on his third space flight when set foot on the lunar surface in December 1972. He became the last of only a dozen men to walk on the moon on December 14, 1972—tracing his only child's initials in the dust before climbing the ladder of the lunar module the last time. It was a moment that forever defined him in both the public eye and his own. Godspeed and thank you, Astronaut Cernan, from Satnews Publishers.